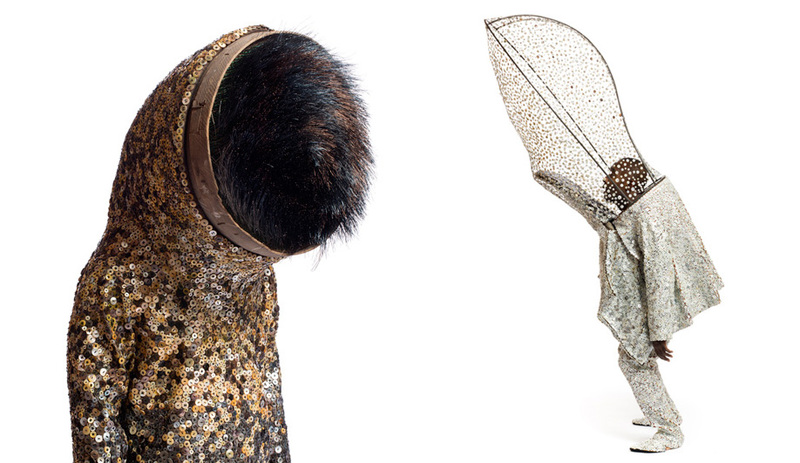 Yayoi Kusama’s couture polka dots, Google’s augmented reality glasses, and Nick Cave’s wildly fun soundsuits made our list of favourite curiosities in 2012. 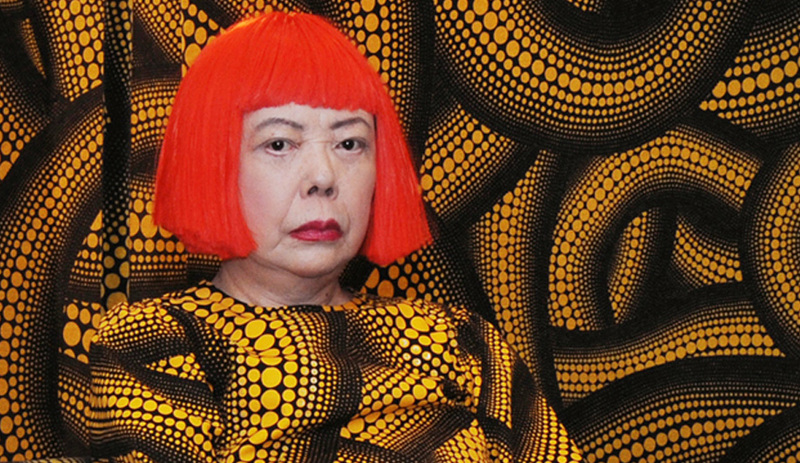 The 83-year-old Japanese artist – famous for her obsessively dot-covered paintings and sculptures – made history this year when she teamed up with Louis Vuitton, launching the fashion label’s most successful artist collection ever. The collaboration resulted in dramatic window displays filled with Kusama’s psychedelic dots on platform shoes, handbags, garments and accessories. 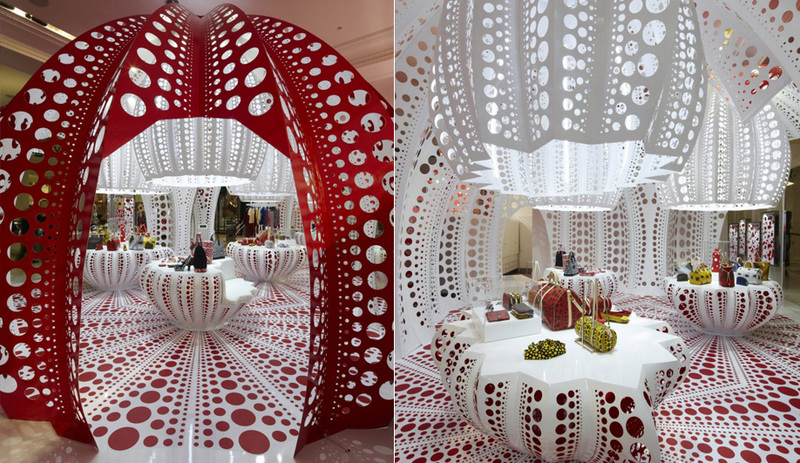 At Selfridges in London, a red pumpkin-shaped pop-up shop was covered in red and white spots. In other boutiques, Kusama mannequins wore polka-dot dresses with matching shoes. Singapore wasn’t kidding around when it first laid out plans in 2006 to become the “botanical capital of the world.” That mission became reality in June with the opening of Gardens By the Bay, defined by 18 towering supertree structures that rise 50 metres upward and are illuminated at night. The giant steel and concrete trunks are topped with solar panels and thousands of thick wire rods for branches. 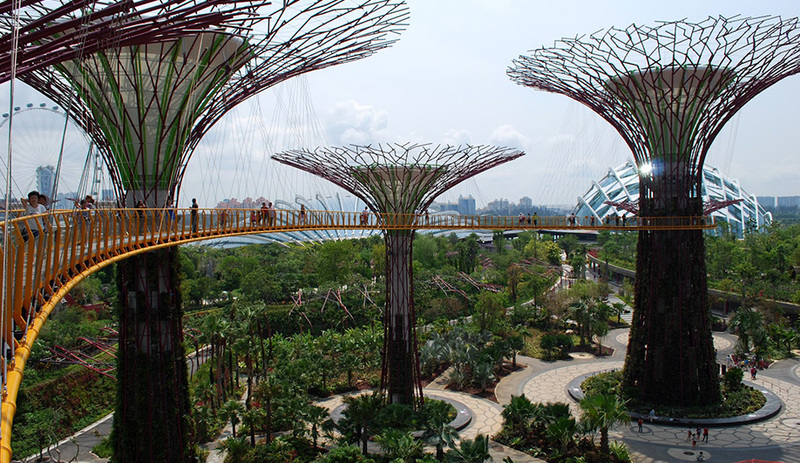 The supertrees form part of a trillion-dollar development in the city’s Marina Bay area that will see 100 hectares turned in a paradise for plants from around the world. 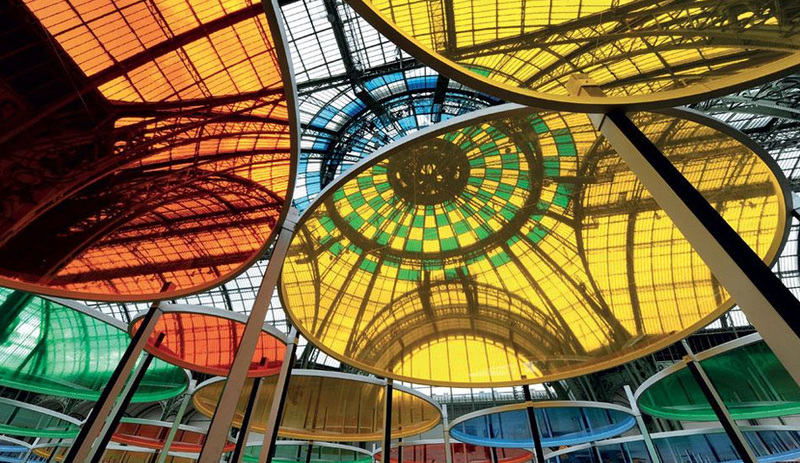 The development’s two main greenhouses, called Cooled Conservatories, won the top prize at the World Architecture Festival this year. 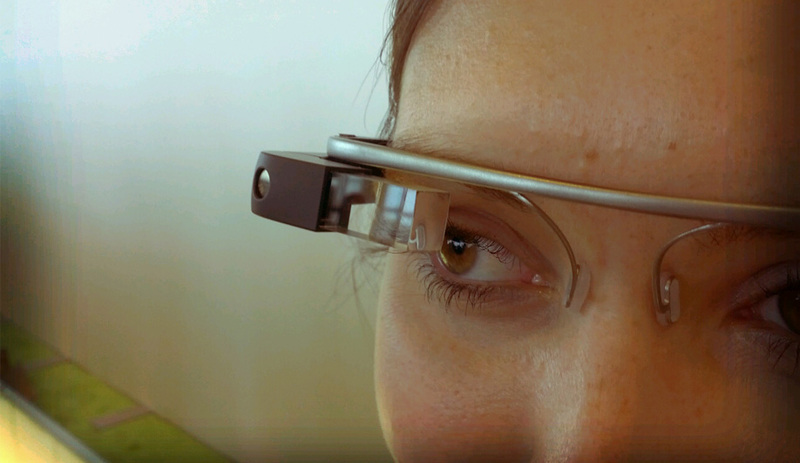 For the past few years, Google has quietly been working on Project Glass – a computer imbedded into wearable frames. Outfitted with a tiny camera, display screen and processor that all fit over one corner of the frame, the streamline glasses allow wearers to transmit videos, read emails and send messages without using their hands or sitting at a desk. The first generation went on sale in June, sold to programmers attending the O/I Conference in San Francisco. Prototypes were also worn by models during Diane Von Fustenberg’s runway show of her spring collection during New York Fashion Week in September. The rest of us will have to wait for the public launch, expected next year. Reviews of the invisible bicycle helmet have been decidedly mixed. Some brush it off as an elaborate gimmick, while others (like us) can’t help but marvel at the engineering and design that have gone into its creation. Called Hövding, the product began in 2005, when its designers, Anna Haupt and Terese Alstin, were students at Lund University in Sweden. The duo wanted to create an alternative to the awkward “mushroom shape” of traditional helmets – and, of course, to combat dreaded helmet hair. Hundreds of crash tests later, Hövding finally hit the European market this year, with North American distribution pending. It snaps into place around the neck like a collar. When the embedded sensors detect abnormal movement in the cyclist, they trigger the airbag hidden inside, which inflates in 0.1 seconds to cover the cyclist’s head. Does it work? 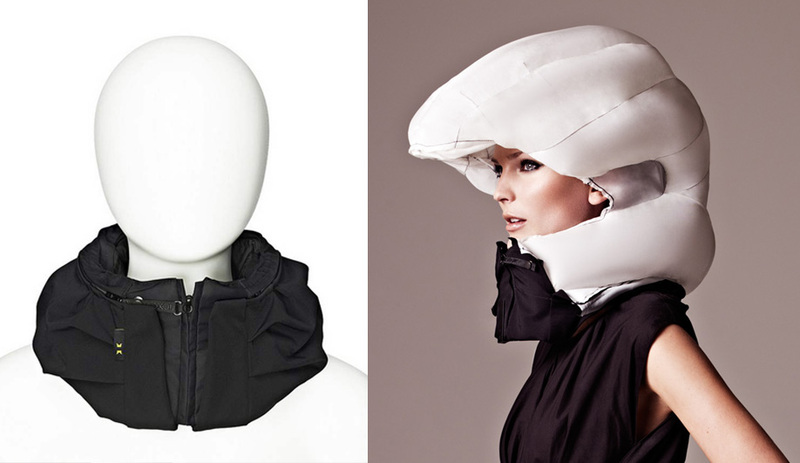 The designers have real-life testimonials to prove their stylish helmet also saves lives. As part of the massive ceramics show Cersaie, the host city of Bologna launched Bologna Water Design, an offsite exhibit devoted to water. Dozens of displays were set up in and among the city’s famous piazzas and historic buildings, but one exhibit utilized space and theme with spectacular results. Within the Bastardini Hospital, a building complex that dates back 500 years, multiple rooms were transformed into displays showcasing ceramic tiles and bathtubs. 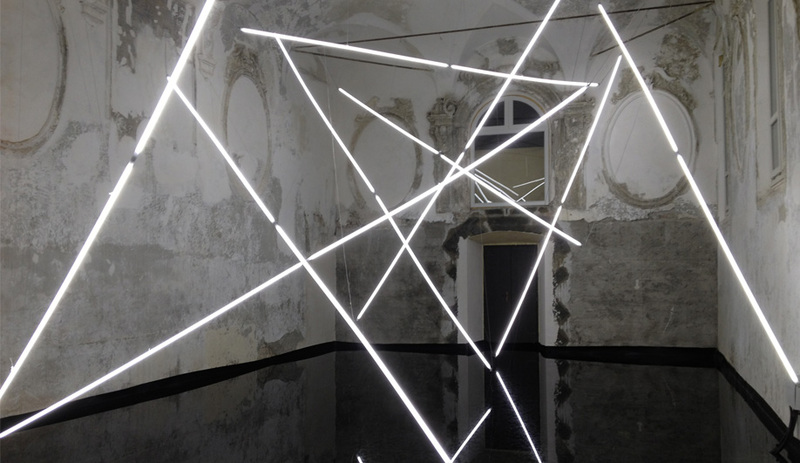 In one room, Italian architect Mario Bellini installed lights by Platek that looked like lighting rods hovering above a shallow reflection pool. 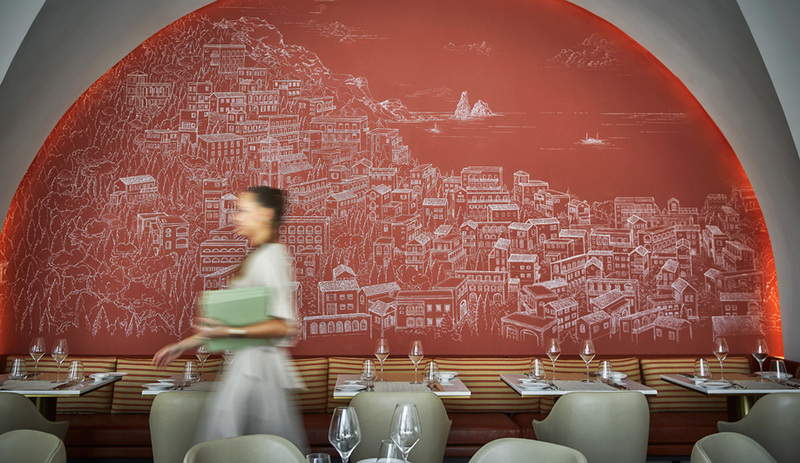 The result was a mesmerizing, poetic environment that mixed old with new. 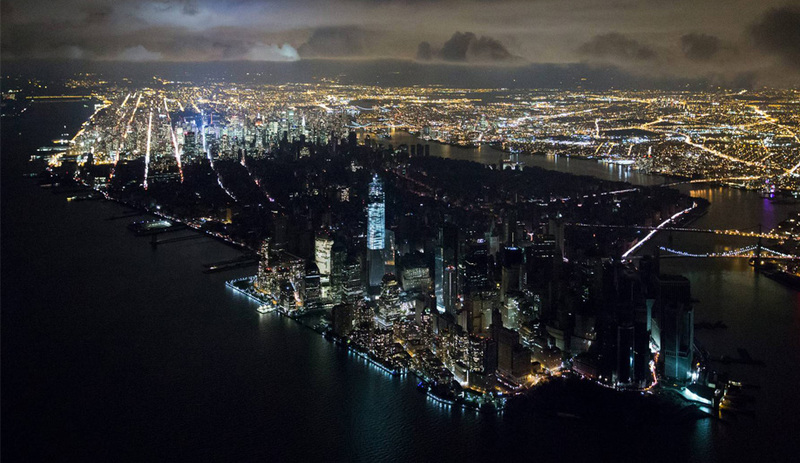 Of the countless Twitpics, Instagrams and Tumblrs that recorded every second of New York’s worst storm in history, it was Dutch photographer Iwan Baan’s aerial viewpoint, shot from a helicopter hovering above Lower Manhattan, that captured Hurricane Sandy’s trail of devastation in one powerful shot. The instantly iconic image ran on New York magazine’s cover a week later and a poster-size version is now available through MoMA for US$20, with proceeds going to the Mayor’s Fund to Advance New York City in support of Hurricane Sandy relief efforts. 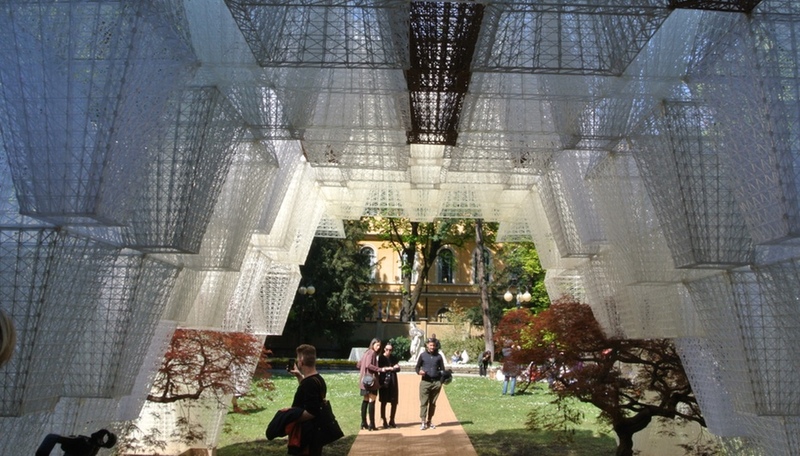 Canada’s pavilion at the Giardini is undeniably awkward in shape – a challenge for every architect who has ever won the honour of transforming it into an exhibit visited by thousands during the Venice Biennale’s three-month run. 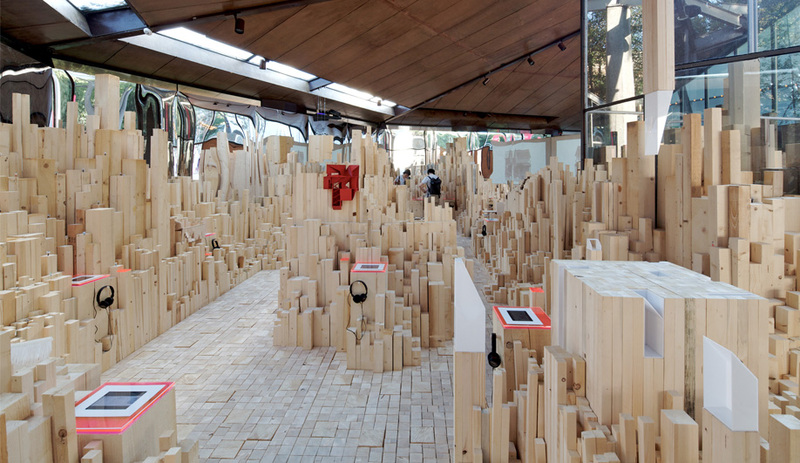 This year, Winnipeg’s 5468796 Architecture and Jae-Sung Chon managed to obliterate its form with thousands of vertical wooden planks that filled the space entirely, except for a narrow walkway that wound through the interior like a path through a forest. The hillscape became the site for architectural models and video proposals made by dozens of jury-selected designers from across Canada, each answering the meaning of migration in their own way. 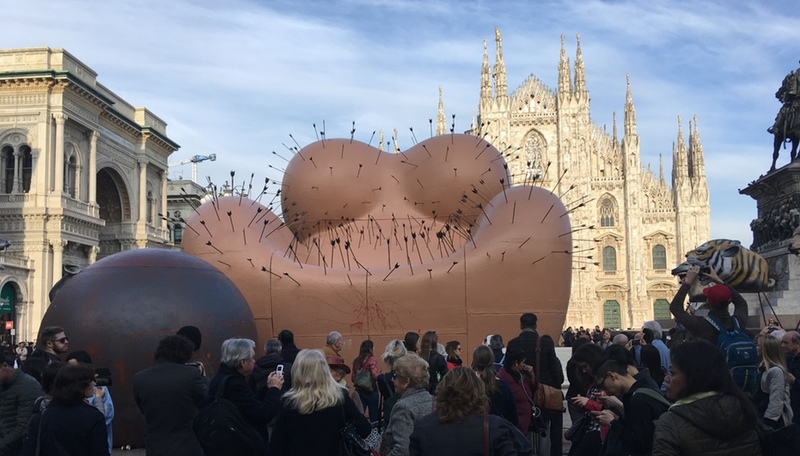 While the setup did overwhelm the models, requiring visitors to seek out the miniature within the massive, that was actually what made the installation work as a whole. Much like Canada, the overall landscape is commanding; you have to really look to see its finer qualities. The Missouri-born artist’s elaborate costumes that emit music and sounds as the wearers dance in them aren’t exactly new; he’s been developing a massive family of beastly costumes for close to 20 years. But the accumulation of these wild creatures has reached epic proportions more recently. Cave’s roots are in dance, but his vision merges artistry, art, sound and performance with seamless appeal. His fantastic, towering soundsuits turn up on performance stages, at street festivals and in art galleries, including at the Mary Boone Gallery in New York. The soundsuits, which are handmade by a team of assistants working out of his Chicago studio, are fabricated from found materials, most notably the twigs Cave collects while going about his daily life. The New York artist and architect Vito Acconci brought his visionary magic to a small pocket of Toronto last spring, enlivening an otherwise unremarkable streetscape located deep within the city’s burgeoning condo land along the waterfront. 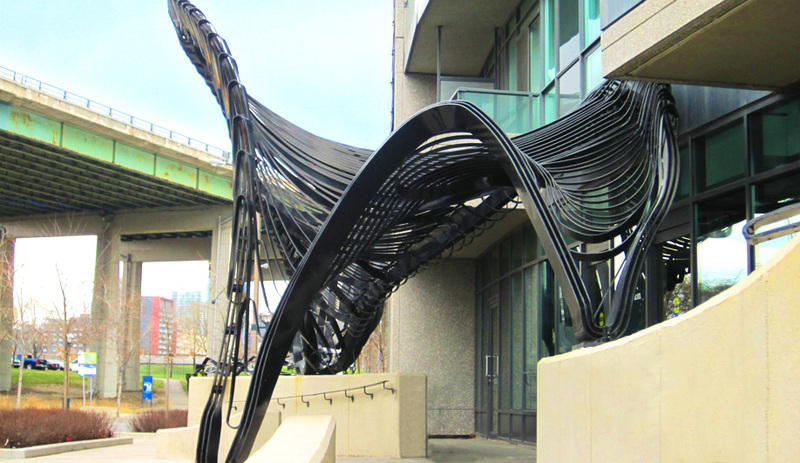 Commissioned by Lanterra Developments, Acconci responded to the concrete setting with elaborate ribbons of black metal that twist like vines overtop of entryways and along the sidewalk. At certain points the sculptural forms morph into benches or break off into smaller bits that pirouette out of the concrete. The piece also provides a privacy wall for tenants. Toronto is full of public art, but Acconci’s provocative installation brings to our city grid a wild imagination that’s rarely unleashed but always welcome.